RGI Media requires full payment for the Subscription Service before the Subscription Service may be accessed and used. You may subscribe to the Service at the rates described in the website. Payment must be received before you may select your password and access the Service. In the event that payment is suspended or interrupted for any reason, then your account will be in default and subject to suspension or termination at RGI Media’s election. Termination of the account does not waive or limit any of your liabilities or obligations. Subscription rates may be changed from time to time, and any changes will be only be assessed on you for the next pay period. Subscribers who sign up for RealGuns’ Introductory offer will retain their original introductory price as long as their account remains active and does not lapse for any reason. Any taxes and third party charges will be separately charged to you, in addition to the subscription rates for the Service. Payment of your subscription will entitle you to use the Service under the terms of this Policy through the end of the period from which you have subscribed. A credit card is merely a method of payment, established for a customer’s convenience. It does not eliminate the customer’s responsibility to pay for services rendered. RGI Media does not offer refunds or credits of any type. RGI Media will not reimburse to you any un-used subscription charges if you elect for any reason not to use the Service during any portion of the period for which you have subscribed. You are responsible for the protection of your password and for any authorized or unauthorized use made of your password. Passwords may not be shared. You hereby agree not to use, or permit others to use, the Service without authorization. RGI Media will fully cooperate with all law enforcement authorities in the investigation and prosecution of any such illegal or malicious activities. You may terminate your use of the Service at any time by selecting “No Auto Renewal” in your Account Manager. RGI Media will not reimburse to you any un-used subscription charges if you elect for any reason not to use the Service during any portion of the period for which you have subscribed. Any and all articles (including text and photographs) appearing on RealGuns.com are intended for the use of its readers and subscribers, and cannot be re-distributed in whole or in part, whether electronically or in printed form. No information from RealGuns.com can be copied in whole or in part on any web site, or on any electronic or written medium. Connecting to the service in a manner consistent with copying content will result in termination of access and RGI Media may pursue appropriate legal action. Robots, Bots, Spiders, Crawlers, etc are not welcome on our web site. They are intrusive and kill system performance for other users. There are many ways to hide bots, and many ways to find them. If you are caught, your subscription and/or access will be terminated. Threatening or menacing comments directed at the service will also result in immediate account termination. Subscription information is treated as confidential and will not be sold, shared, or provided to anyone, unless the user information is solicited through court order. The material that appears on RealGuns.com is for informational purposes only. Despite our efforts to provide useful and accurate information, errors may appear from time to time. Before you act on information you’ve found on our site, you should confirm any facts that are important to your decision. We are not responsible if information we make available on this site is not accurate, complete or current. Any reliance on the material on this site is at your own risk. This site and the contents thereof (including but not limited to software, interfaces, files, graphics, text and data found on the site) are the property of and owned by RGI Media or its licensors and is protected by copyright, trademark and other laws of the United States and other countries. RGI Media grants you a revocable license to display and electronically copy, download and print hard copy versions of the material contained on the site for your personal and noncommercial use, provided you do not modify or delete any copyright, trademark or other proprietary notice that appears on the material you copy, download or print. No other use of any of the contents of the site is licensed, and you agree that you will not make any other use of the material on the site, including but not limited to the copying, modification, distribution, transmission, performance, broadcast, publication, licensing, reverse engineering, transfer or sale of, or the creation of derivative works from, any of the contents of the site. You agree that you will not frame or establish inline links to any of the content of our website, nor may you incorporate into another website or other product or service any intellectual property of RGI Media or any of its licensors. This site features trademarks, service marks and logos that are the property of RGI Media and/or its licensors. The site also may include trademarks, service marks or logos of other third parties. All of these trademarks, service marks and logos are the property of their respective owners, and you agree not to use them in any manner without the prior written permission of the applicable owner. YOUR USE OF THIS SITE IS AT YOUR SOLE RISK. THE SITE IS PROVIDED ON AN “AS IS” AND “AS AVAILABLE” BASIS. WE RESERVE THE RIGHT TO RESTRICT OR TERMINATE YOUR ACCESS TO THE SITE OR ANY FEATURE OR PART THEREOF AT ANY TIME. REAL GUNS INC. EXPRESSLY DISCLAIMS ALL WARRANTIES OF ANY KIND, WHETHER EXPRESS OR IMPLIED, INCLUDING BUT NOT LIMITED TO THE IMPLIED WARRANTIES OF MERCHANTABILITY AND FITNESS FOR A PARTICULAR PURPOSE AND ANY WARRANTIES THAT MATERIALS ON THE SITE ARE NONINFRINGING; THAT ACCESS TO THE SITE WILL BE UNINTERRUPTED OR ERROR-FREE; THAT THE SITE WILL BE SECURE; THAT THE SITE OR THE SERVER THAT MAKES THE SITE AVAILABLE WILL BE VIRUS-FREE; OR THAT INFORMATION ON THE SITE WILL BE COMPLETE, ACCURATE OR TIMELY. IF YOU DOWNLOAD ANY MATERIALS FROM THIS SITE, YOU DO SO AT YOUR OWN DISCRETION AND RISK. YOU WILL BE SOLELY RESPONSIBLE FOR ANY DAMAGE TO YOUR COMPUTER SYSTEM OR LOSS OF DATA THAT RESULTS FROM THE DOWNLOAD OF ANY SUCH MATERIALS. NO ADVICE OR INFORMATION, WHETHER ORAL OR WRITTEN, OBTAINED BY YOU FROM REAL GUNS INC. OR THROUGH OR FROM THE SITE SHALL CREATE ANY WARRANTY OF ANY KIND. REAL GUNS INC. DOES NOT MAKE ANY WARRANTIES OR REPRESENTATIONS REGARDING THE USE OF THE MATERIALS ON THIS SITE IN TERMS OF THEIR COMPLETENESS, CORRECTNESS, ACCURACY, ADEQUACY, USEFULNESS, TIMELINESS, RELIABILITY OR OTHERWISE. TO THE FULLEST EXTENT PERMITTED UNDER APPLICABLE LAW, YOU UNDERSTAND AND AGREE THAT NEITHER REAL GUNS INC. NOR ANY OF ITS AFFILIATES OR THIRD PARTY CONTENT PROVIDERS SHALL BE LIABLE FOR ANY DIRECT, INDIRECT, INCIDENTAL, SPECIAL, EXEMPLARY, CONSEQUENTIAL, PUNITIVE OR ANY OTHER DAMAGES OR LOST PROFITS RELATING TO OR RESULTING FROM YOUR USE OF OR INABILITY TO USE THIS SITE OR ANY OTHER SITE YOU ACCESS THROUGH A LINK FROM THIS SITE OR FROM ANY ACTIONS WE TAKE OR FAIL TO TAKE AS A RESULT OF EMAIL MESSAGES YOU SEND US. THESE INCLUDE DAMAGES FOR ERRORS, OMISSIONS, INTERRUPTIONS, DEFECTS, DELAYS, COMPUTER VIRUSES, YOUR LOSS OF PROFITS, LOSS OF DATA, UNAUTHORIZED ACCESS TO AND ALTERATION OF YOUR TRANSMISSIONS AND DATA, AND OTHER TANGIBLE AND INTANGIBLE LOSSES. THIS LIMITATION APPLIES REGARDLESS OF WHETHER THE DAMAGES ARE CLAIMED UNDER THE TERMS OF A CONTRACT, AS THE RESULT OF NEGLIGENCE OR OTHERWISE ARISE OUT OF OR IN CONNECTION WITH THE USE, INABILITY TO USE, OR PERFORMANCE OF THE INFORMATION, SERVICES, PRODUCTS OR MATERIALS AVAILABLE FROM THIS SITE, AND EVEN IF WE OR OUR REPRESENTATIVES HAVE BEEN NEGLIGENT OR HAVE BEEN ADVISED OF THE POSSIBILITY OF SUCH DAMAGES. BECAUSE SOME JURISDICTIONS DO NOT ALLOW LIMITATIONS ON HOW LONG AN IMPLIED WARRANTY LASTS, OR THE EXCLUSION OR LIMITATION OF LIABILITY FOR CONSEQUENTIAL OR INCIDENTAL DAMAGES, ALL OR A PORTION OF THE ABOVE LIMITATION MAY NOT APPLY TO YOU. RGI Media may provide as a convenience to you, links to websites operated by other entities and persons, but makes no representations whatsoever about any other website which you may access through this one. Any link to a non-RGI Media website does not mean that RGI Media endorses or accepts any responsibility for the content, or the use of such Web site. If you use these sites, you do so at your own risk. RGI Media makes no warranty or representation regarding, and does not sponsor or endorse, any linked websites or the information or materials appearing thereon or any of products and services described thereon. Furthermore, links do not imply that RGI Media is affiliated or associated with, or that any linked site is authorized to use any trademark, trade name, logo, or copyright of RGI Media. RealGuns.com is intended for a general audience and is open for public view and is aimed at those interested in firearms, shooting sports, fishing, firearm accessories and other related activities. 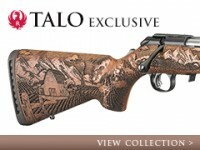 Advertising on the RealGuns.com site is for products and services related to that demographic.